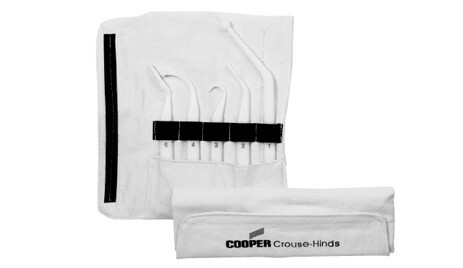 The Cooper Crouse-Hinds EYS Tool Kit for Use with Sealing Fittings and Hubs lets you safely and reliably pack the fiber dam in explosionproof sealing fittings. Consisting of five patented, two-sided tools in a handy canvas bag, the EYS Tool Kit makes the critical steps of separating electrical conductors and packing fiber dams quick and easy. The EYS Tool Kit consists of five tools and a canvas tool bag. Four tools have two unique ends for a total of 9 different tools. Each tool is numbered for easy identification. Tools are constructed of durable plastic with smooth and rounded surfaces that will not abrade the electrical insulation. The Hook tool (#3) with a large hook on one end and a small hook on the other end is designed to lift and separate individual wires. The Packing tools (#1, #2 & #4) have rounded ends designed for packing fiber in between and around electrical conductors. The Wedge tools (#2 & #5) are designed for hands-free separation of conductors while packing fiber. The Mirrored tool (#5) allows for easy inspection of the sealing fittings. All tools are sized and precisely angled to accomodate various sizes of fittings. The canvas tool bag is designed to neatly store and protect tools while not in use. Download the Cooper Crouse-Hinds EYS Tool Kit PDF below or call 714.835.6211 for more information.